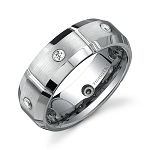 This 8mm tungsten ring has 7 CZ Stones for a great unique look. We also have this ring in a matching 6mm set that is shown below. Q: Are these real diamonds? No, these are Cubic Zirconia stones. (CZ's) They look like real diamonds, but are far less expensive. If you order this or anything else on our site, you have 30 days to return it for a full refund if you are not happy for any reason. Was this answer helpful? 89 of 92 Customer(s) found this Answer helpful. Q: What material is this ring made off and does it strip after a time? A: This ring is made of Tungsten material. Tungsten is a metal that will never tarnish, chip, scratch or bend. I hope this helps! Was this answer helpful? 64 of 65 Customer(s) found this Answer helpful. Q: I already own one Tungsten Ring with a carbon fiber inlay and I love it. I wear it all the time. I never take it off. I want to order your 8MM Tungsten Carbide Beveled Ring with stones to replace my old weddng band that has become scratched and chipped over the years. My question is, how durable will the inset stones be if I also wear this ring all the time, i.e. washing dishes, taking showers, etc? 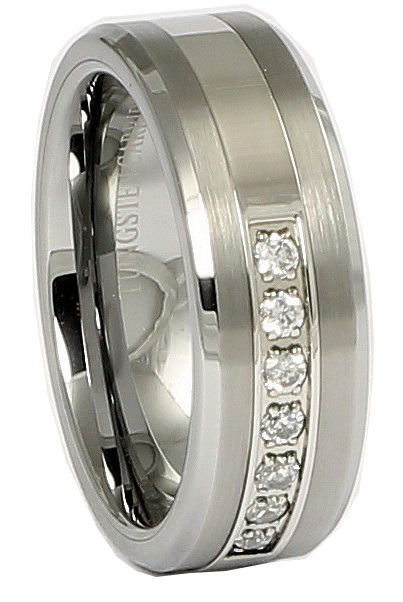 I know the Tungsten part of the ring is practically indestructable but I am worried about the stone insets. Thank you for responding to my question. A: Hi there. You will be fine with everyday projects and normal wear. If you are going to work on a car or something like that, I would take it off. Normal everyday wear - you will be fine. Hope this helps! Was this answer helpful? 56 of 57 Customer(s) found this Answer helpful. A: Hi! These rings we sell only come with CZ stones to keep the price down. Thank you! Was this answer helpful? 36 of 38 Customer(s) found this Answer helpful. Q: Is this a solid ring? Is it durable? Do you have it in size 10 or 11? Q: Can I replace the CZ with real diamonds? Q: How many stones, are they diamonds, and if so the tw of the diamonds? Q: First, beautiful rings, all of them. Will this type of ring ever be available in gold? Q: Are those diamonds in this ring? Q: Is this a comfort band? What is the T.W.? Q: Will the cz stones turn yellow ? Turn color ? The stones will not turn yellow or turn color. You would clean this like you would any other ring with stones. If you need anything else, please let us know! Q: what are the stones on the ring and are they on both sides? A: These are Cubic Zirconia stones. (CZ's) They look like real diamonds, but are far less expensive. If you order this or anything else on our site, you have 30 days to return it for a full refund if you are not happy for any reason. Q: How wide is the ring? The ring was as described. I ordered it in a 10 1/2 and had to wait two weeks to give it to my husband. He in turn wore it for two weeks, before he figured out it was just a bit too big. He said he will order another one, but besides that the ring is gorgeous, he has gotten many compliments on it, particularly on how shiny it is. I purchased 2 rings in the past 30 days. We are very happy with the look and style of this ring. The ring is actually a slight darker Tungsten than the photo, but preferred the way it looked in person. Good quality, hasn't scratched, and no one can tell the diamonds are not real. very pleased. i purchased this ring for my husband. He was very surprised and very happy. The ring arrived quickly. Very pleased with this ring - picture does not do it justice. I bought this ring as a temporary replacement for my own tungsten ring that was misplaced during our recent move to our new house. The look, feel, and weight are very similar to the old one, so much that I can't tell the difference when I have it on. My only wish was that I had purchased my first one here, which would have saved me a lot of money! Bought my husband a Tungsten ring because of the type of work he does, and also because he lost his wedding band. It's durable and he's very please with it. Also it looks way better than his original band. The ring is so nice and my fiancée gets compliments all the time. I had to get his ring a half size smaller and the exchange was seamless. In a week from the day I returned it, I had it in my mailbox resized. 100% recommend. Love my ring! Customer service is excellent and very helpful answering all my questions. All my friends and family thinks it's a high end ring. I highly recommend this ring. Very nice piece. Anxious to see how it wears over time. Very happy with purchase. I am happy with the quality of this ring. I'm not so sure my fiance is satisfied with the width because he wanted it in a 6mm. But I love it! It is a beautiful ring and I think I got a fantastic deal on this item. I am also very impressed with Tungsten Support. They were very efficient and extremely nice in addressing all of my questions and any concern I had. I will definitely be glad to do business with them again!! Yes i am satisfied with my order! My husband love it! It fit perfectly! The quality is awesome! Very happy with this ring, looks just like it does in the photo. I am very happy and satisfied with everything including live support. Would highly recommend for the price and for someone who wants a unique ring.